Feng Shui – ancient doctrine, which has incorporated all sorts of methods and principles for creating harmony in a person's life through the arrangement of space, where he lives. The teaching of Feng Shui can tell you about how you want to place a particular item, how to change the living space or working space to attract into your life love, happiness, wealth and other benefits. Among such items is an important three-legged toad, which today is one of the most common decorations of interiors, prinosyaschie wealth in the house. 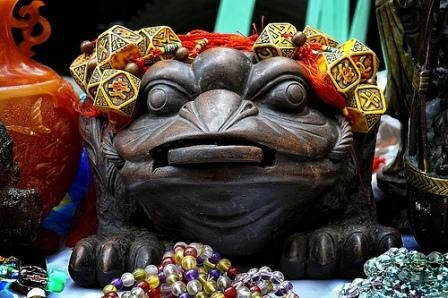 A three-legged frog, which can be easily purchased at any store of pleasant things and gifts, Feng Shui is a talisman, attracting money luck, wealth and prosperity to the house in which it lives. In addition, toad in Feng Shui – it is also a symbol of immortality (longevity), as certain species of frogs can live a very long time, up to 40 years. This statue, as a rule, is executed from natural materials and is a different size figure of a toad sitting on a pile of Chinese coins and/or holding coin in the mouth. It is important to not just buy a toad for interior decoration at home, garden, office, etc., it is important correctly to place it in the room. Place the frog on the bottom of the fountain or the pond of the garden (if any). How do you think the Chinese, that while in the water, the toad is able to bring more money energy. If bodies of water in ornamental fountains or pools you have, define the South-Eastern side of their homes (a room or space in the room). Put the frog on the floor, the nightstand or Desk on the left side (far left corner) of your desktop or bed. This should take into account the fact that the frogs are afraid of heights and place them too high you should not. Turn the frog so that she looked inside the room or house (depending on placement). Put it under the frog smooth a bill. Attention! Remember, the more toad like real, the stronger its magical properties and effects. Do not place a magic frog in the bathroom, the bedroom, the toilet or the kitchen. The best place for frog – living room or office. With all of this, you should know that the frogs in your home should have no more than 9 units, while the Chinese recommended a few times in a week to rinse the frog with running water, returning it wet in its place.